In order for a ship to sail, it needs to be well constructed and have sturdy, manipulable, and well attached sails. But it also needs the wind which provides the power for its movement. Similarly, in our work of authentic renewal there are many important conditions and preparations which need to be diligently fulfilled. But it is only through the powerful “wind” of the Holy Spirit that our work can be spiritually effective and bear abundant fruit. While there is no substitute for this personal and communal prayer, we can often be strengthened, encouraged, and supported by the inspiration of others. Here below we share live events, recordings, talks and interviews, and related projects/ministries which communicate such inspiration in relation to sacred music, and which we hope can be of benefit to all! We hope it will inspire you to see ordinary people “doing something beautiful for God,” as St. Teresa of Calcutta loved to say. If you have videos or photos you’d like to share, please let us know! Here we share links to the inspirational work being done by our friends, in the fields of Sacred Music and Art, as well as other related fields. We hope to expand this page in the coming months! This is the website of my friend and colleague David Clayton - artist, educator, and author - who is now also the Provost of Pontifex University. He never ceases to provide new insights and inspiration through his books, talks, blog, podcasts, etc. Our ongoing conversations on sacred music will be presented by youtube and podcasts starting this spring of 2019! These podcasts are presented by my colleague Dr. Jennifer Donelson along with church musician Peter Carter. Dr. Donelson is an Associate Professor and the Director of Sacred Music at St. Joseph’s Seminary (Dunwoodie) in New York, where she also teaches sacred music courses in the St. Cecilia Academy for Pastoral Musicians. She is a dynamic force in the renewal of sacred music today, in organizing events, leading choirs, and giving lectures around the U.S. and beyond. These podcasts educate and inspire through interviews with clergy, composers, and others who are making important contributions to this renewal. Over the past years, it has been a joy for me to discover the sacred music of Roman Hurko, a Ukrainian-Canadian composer who lives in NYC. He has composed most of his music for the Liturgies of the Eastern Catholic and Orthodox Churches. In 2016 our Cor Unum Chorale performed his entire Liturgy No. 3 (English) for a series of Benefit concerts to help Christians and other religious minorities who were suffering intense persecution in the Middle East. The above link gives a taste of his magnificent Liturgy No. 3. The Franciscan Friars of the Renewal were founded in the Bronx by Fr. Benedict Groeschel in 1987, to serve the poor and to be a living witness to the Gospel of Christ. The Jernberg family has been blessed by their friendships with the Friars throughout the years, beginning in the late 1990's. We have been encouraged and inspired by their radical, loving commitment to the Faith and their amazingly creative ministries. 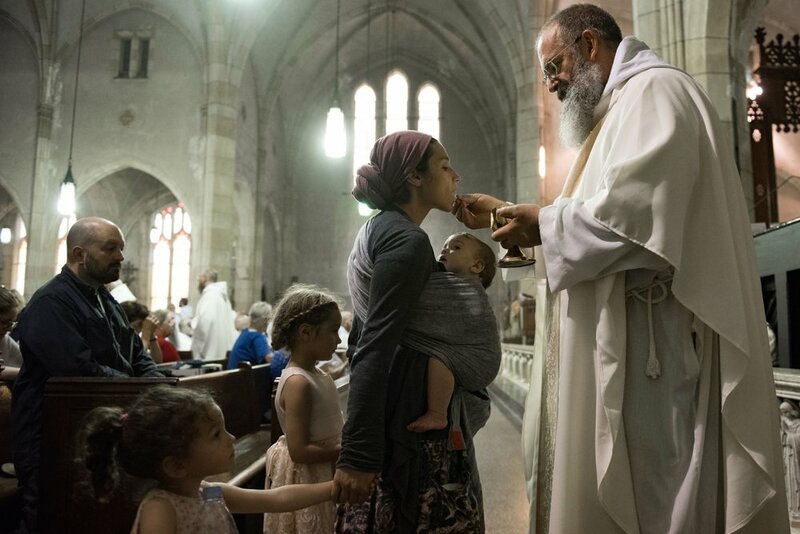 What is the connection between the vocation of these Friars, and our own work for the renewal of sacred music? Is it not the same blazing fire of God's love, which draws us out of our comfort zones and inspires us to serve God and neighbor, wherever we are called, with great humility and joy?